When you add a bookmark in Firefox, it will automatically use the web page title as the name for that particular bookmark (as shown on the screenshot below). You can either hit Enter to accept the default bookmark name, which is how it will appear inside the Bookmarks menu, or you can start typing over a new name. 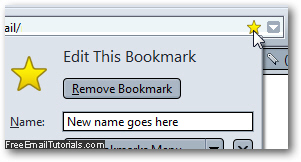 But Firefox also let you rename a bookmark after the fact, and this tutorial will show you three ways to change the name of a bookmarked site. 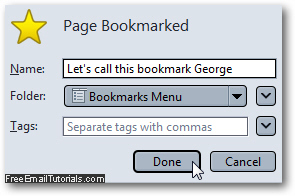 Follow one of these methods to rename a bookmark - which you pick depends on the circumstances and your personal preferences, and all amount to the same end result. Mozilla Firefox will open the "Properties" dialog for the bookmark in question, and the text of its current name will automatically selected, as shown on the screenshot below. 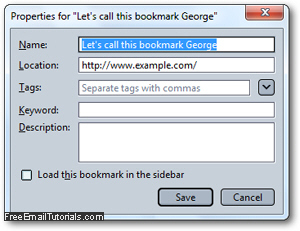 To rename the bookmark, simply start typing a new name over it, and hit Enter to accept and apply the name change: (or click on the "Save" button). Unlike Internet Explorer, which stores all bookmarked sites as actual files inside the Favorites folder under your Windows profile, Firefox keeps track of them differently, which means that you can type any name you want to rename a bookmark, including characters that would normally be excluded for file names (on Windows anyway, since Mac OS X and Linux handle file names in another way, behind the scenes).